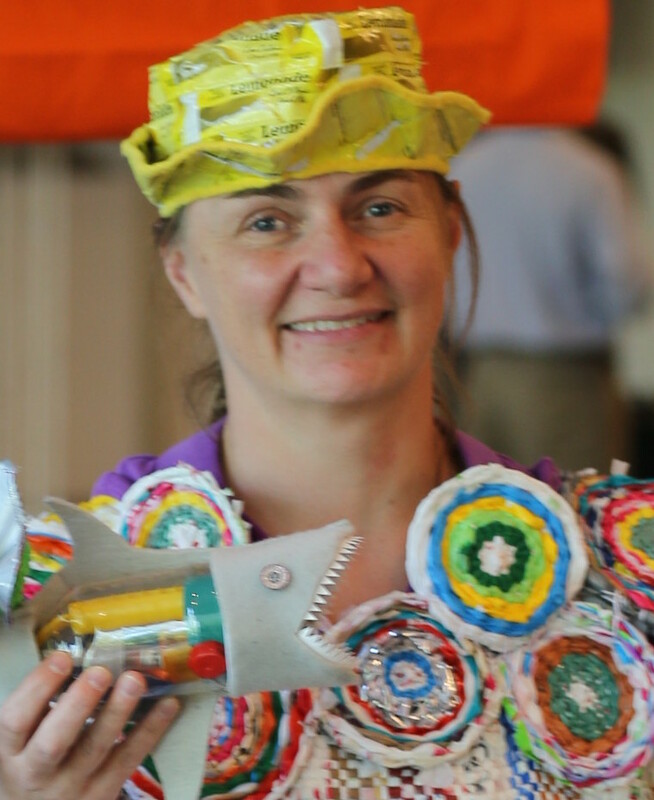 Find out how you can build stronger community while also creatively reusing trash. It’s like a 2-for-1 good deed! Many community groups crochet plastic bags into mats for people who are currently homeless. 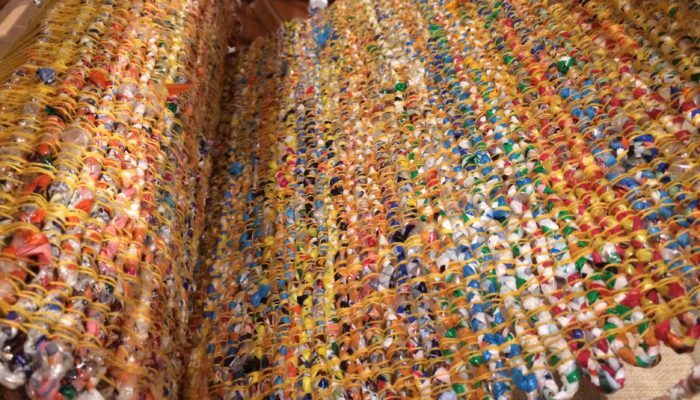 To make these mats, people cut plastic bags into loops and then loop them to together to make a type of yarn called “plarn.” It takes about 500-700 plastic bags to make a mat and between 12-30 hours depending on how fast you crochet. In Canada, an organization called Milkbags Unlimited weaves sleeping mats from plastic bags. They weave the mats on big wooden peg looms. In Canada, milk is often sold in plastic bags rather than cartons or jugs. Pink and grey sensory fidget blanket including- -felt weaving patch with button detail -dangling beads and tactile trim coming out of a stuffed pocket -layers of felt which can be opened and folded with button detail in the centre -zipped stuffed pouch with tactile trims -tactile felt flower with ribbons and buttons -toggle and velcro patch -swinging plastic ring with fleece stuffed pocket and Pom Pom balls -marble maze -tubes filled with different tactile objects -lots of different fabrics including satin, cotton, fleece, velvet and felt -bumpy fleece backing This blanket will be on my Etsy store soon. The link is in my bio. Project Linus – Quilters make small quilts for firefighters and police officers to give to children at the scene of a fire or other challenging situations. PGH Handmade Hearts – The goal was to make lots of hearts, then tag them a positive message. These were then placed around Pittsburgh to share compassion after the shooting at the Tree of Life Synagogue in October 2018. Knitted Hand Muffs – Twiddlemuffs are knitted muffs with buttons and ribbons. They capture the attention of people with dementia and help reduce agitation. Lily’s Love Birds – Lily was inspired by the book “I am Malala” to help girls around the world to go to school. She and her sister sew adorable fabric birds from recycled fabric scraps. They sell for 1 bird for $9 and 3 for $25. New craft supplies cost a lot. So one way to reduce the budget and environmental impact of a community event is to make crafts from recycled materials. Every dollar your community organization doesn’t spend is one less dollar you have to raise. Here are some crafts that my taiko group offered at our summer festival. It was part of the fundraising effort, so people bought tickets to make these crafts. Some community organizations raise funds through trash fashion shows – learn more in episode 13 of this podcast! For example, the City of Orlando has a trash fashion show called Trash 2 Trends which raised $22,000 or a school in Bend, Oregon raised $20,000 at their event, Rubbish Renewed. Another way that schools and charities raise money through creative reuse is to collect items for Terracycle or other similar organizations. Terracycle has a program called Brigades where you sign up to collect items like contact lens packaging, Brita cartridges and many other types of packaging . They pay you to ship the items and they pay a certain amount per item. The brigades program works best for a large population such as a school because they ask you to collect very specific branded items. Terracycle then finds ways to creatively reuse all these materials. 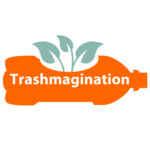 While Terracycle brigades pay your organization to collect items, there are many other organizations who will take your trash items for free and find a creative way to reuse them. The time that you spend volunteering to clean and sort your items can help build stronger community organizations. For example, many creative reuse centers take items like small jars, plastic caps, wine corks, wooden craft sticks, prescription bottles, CDs or DVDs, motherboards, keys and lots of other items that can’t go in your recycling bin. I also find many pre-school and elementary teachers are looking for specific items for crafts in their classrooms. Always check with community organizations and teachers before starting to collect a trash or recycling item in bulk.